Introducing article search for websites! It’s an exciting time to publish open access journals on Scholastica. Scholastica Open Access Publishing gives journals all the tools they need to easily and affordably publish a professional OA journal without technical hassles, and we’re regularly adding features to improve the publishing process and reader experience. It’s even easier for readers to find relevant content on Scholastica journal websites via the new journal website search feature. Readers will now find a search icon in the upper righthand corner of all Scholastica journal websites. 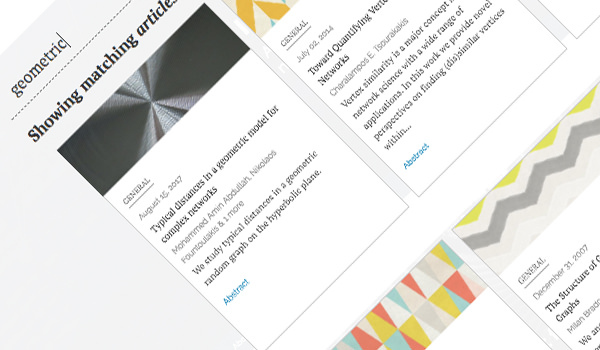 The new search feature gives readers the option to search the journal’s articles or blog posts. Readers can type in search terms like author names, keywords, and phrases to find content on particular topics, and even type in DOIs to find specific articles. The new journal website search comes in addition to the universal Scholastica-wide article search feature. The universal article search enables visitors to Scholastica to search for keywords and phrases to find relevant articles from all journals publishing via Scholastica - a prime opportunity for new readers to stumble upon your journal! We’ve also introduced an in-website PDF article view to make for a smoother and more enjoyable reading experience. Now, rather than being redirected to a separate article page when they click on an article to view, visitors to your journal website will be able to read articles within the website. The new in-website PDF article viewer features the article’s image prominently at the top for a more visual reading experience. All primary article metadata is easily visible from the header image including the author(s) name, publication date, article DOI, and author(s) ORCID (if they provided one). Readers can also easily access any media files that accompany articles from a “Data Sets/Files” link below the header image and download article PDFs via the “Save articles as” link. Finally, we’ve introduced new fields for authors and editors to input ORCIDs to accompany submissions and published articles. The Scholastica submission form now includes an ORCID field with validation to ensure authors type their complete ORCID. Additionally, editors now have the ability to add ORCIDs to articles they publish by filling in the new “ORCID ID” field in the article publishing form. You’ve likely heard of ORCIDs, which are persistent digital identifiers for scholars. Scholars can list all of their works under their ORCID ID to create an easy-to-access aggregate of their scholarly record. In addition to its aggregating benefits, ORCID enables scholars to confidently distinguish their work from that of other researchers with similar names, as well as to keep a consistent record of any works they’ve done under different names. We hope you enjoy these new features! As always, if you have any questions please don’t hesitate to contact us at support@scholasticahq.com. Get tips to make your academic journal more digitally focused in Scholastica's new free-to-download eBook resource: The Journal Editor's Definitive Guide to Digital Publishing. Björn Brembs explains why he believes journal publishing should be upended from the current model, in which institutions pay publishers for access to content, to one in which the academic community pays for services to publish content and retains ownership of research. How can more scholars and journals embrace preprints to make research freely accessible? This slideshow co-created by Scholastica and Authorea addresses this question and more.